Booking live music for your wedding is really essential to setting the tone and atmosphere of your day. Whether you're opting for a band or a DJ in the evening, there's something really special about welcoming guests to your wedding reception with live music. While Guitarists, Pianists and String quartets are extremely popular options, hiring an Accordionist is a great way to really set your day apart from the rest, creating a relaxing European atmosphere for you and your guests to enjoy. 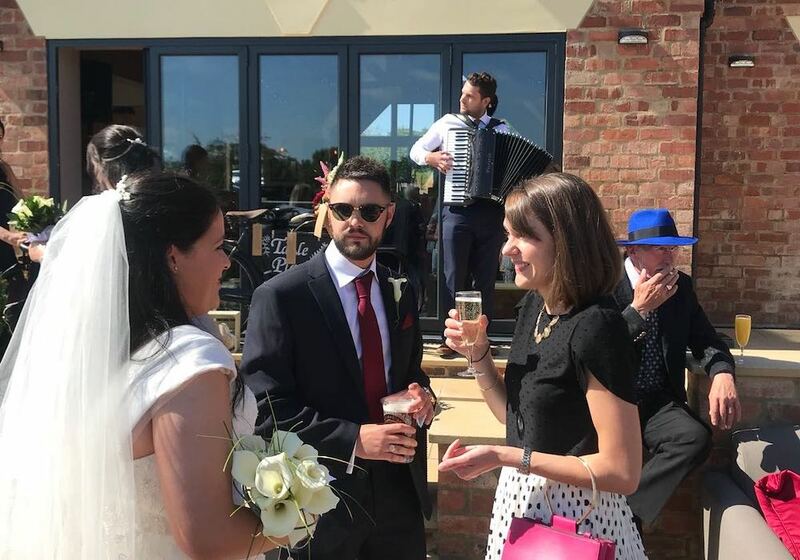 The Accordion is an incredibly versatile instrument, and is also one of a few instruments that can be played whilst walking, giving all your guests the chance to hear the music, say hello, ask questions and even make requests! Jonny has a huge amount of experience playing at weddings as both a solo Accordion player and within various bands and always happy to work with you on special requests, whether that's learning your favorite song, playing you down the aisle or your first dance song with one of his bands. Jonny also often works with other talented musicians and can create bespoke packages from a two piece to a 5 piece band. With solo prices starting from £250, simply get in touch below for a quote. Thank you so much for Saturday. Everyone was raving about the Accordion and what a great choice for fun drinks reception music! You even got a special mention in Geoffs speech and a huge round of applause! Make your wedding reception unique and memorable for you and your guests. Suprise your guests and give them something to talk about when they arrive at your reception. Jonny has been playing for over 15 years and has performed at hundreds of weddings. The Accordion music will make your guests feel as if they have been transported to southern Europe. Lots of excellent reviews by previous wedding couples and event organisers. Create fantastic reactions, for your photographer to capture. Jonny started learning the Accordion at the age of 15. Since becoming a full time musician Jonny has performed at hundreds of events all over the UK, playing at weddings, parties, corporate events as well as restaurants, bars and festivals. Jonny has also played on the BBC period drama 'The Peaky Blinders' and at various celebrity events in the UK and Europe. Jonny has a huge repertoire and plays many different styles of music such as French Musette, Tango, Italian Folk, Jazz, Gypsy Jazz and Classical music, as well as popular modern songs.